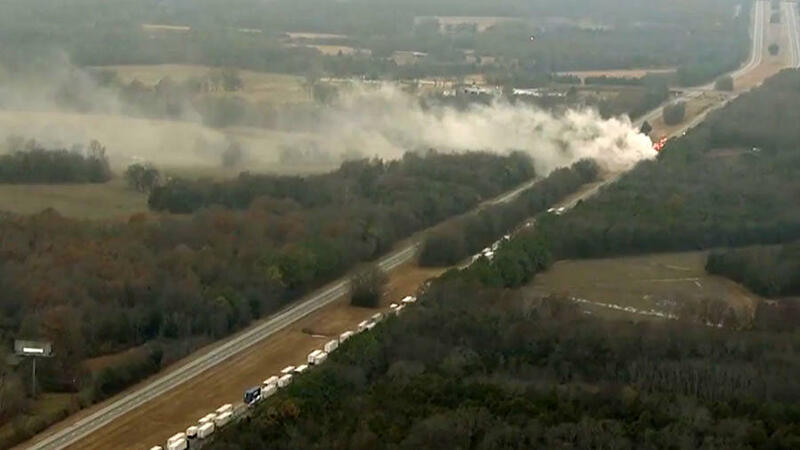 MURFREESBORO, Tenn. -- Many residents have been evacuated southeast of Nashville after a semi-truck crash involving hazardous chemicals, CBS affiliate WTVF-TV reports. The crash happened early Wednesday morning on Interstate 24. Two semis were involved in a crash, causing one of them to catch fire and spill pool supplies - including chlorine tablets. Other unknown chemicals may have been involved as well. At least 75 homes were evacuated after residents were earlier asked to remain indoors and turn off their ventilation units. Emergency officials were seen going door to door, alerting neighbors of the evacuations. Chlorine itself does not burn, but it does give off fumes and can be explosive if mixed with gasoline. First responders have been monitoring the risk of smoke or vapors, which can burn eyes, skin and lungs. However, buses will not run in evacuation areas. A five-mile stretch of the interstate has been blocked by the crash. Drivers were being rerouted in both directions. Rutherford County officials said drivers should not get out of their cars for any reason. It’s unknown when the scene would be cleared, but the cleanup process could take up to six hours. Several semis were seen driving backwards on the interstate in an effort to turn around.